Ever wish you could spend less time doing laundry? 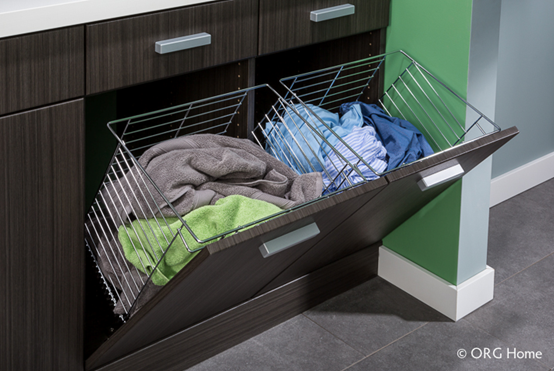 With a few strategic updates to the layout of your laundry room, you can make every step from sorting to folding and hanging faster and easier. By designating space for each activity and all the supplies you need to store, you can transform your laundry room into a tidy, attractive area that makes keeping up with this ongoing task feel more enjoyable and less like a chore. The first step to organizing your laundry room is deciding what belongs there. Organize laundry cleaners such as detergents, stain removers, and fabric softeners and place them on open shelves near the washing machine for quick access. Household cleaners and supplies can be stored in cabinets behind closed doors, maintaining a clean and organized appearance. If you have the available storage space, you might also keep an ironing board, extra towels or linens in your laundry room. It’s amazing how much more room you can find when you take advantage of vertical space. Adding a custom organization system with cabinets, shelves, hampers, and baskets can dramatically increase your storage capacity, letting you store supplies within arm’s reach while keeping them tidy behind closed doors. Prep dirty laundry for washing by using deep pull-out laundry hampers to organize darks, lights, and delicates as they come into the laundry room. When one of the hampers gets full, just remove the basket and tip it into the washing machine. Instead of a bulky, full-size ironing board, try a space-saving fold-out board that’s easy to stow off the floor and out of sight when not in use. And it’s not just for the laundry room. 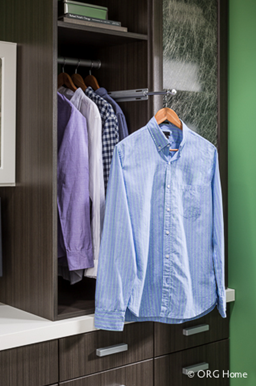 This compact board offers convenient ironing in your bedroom when you add it to an ORG Home closet organizer. You can also use a hook to hang your full-sized board flush against a wall when it’s folded. 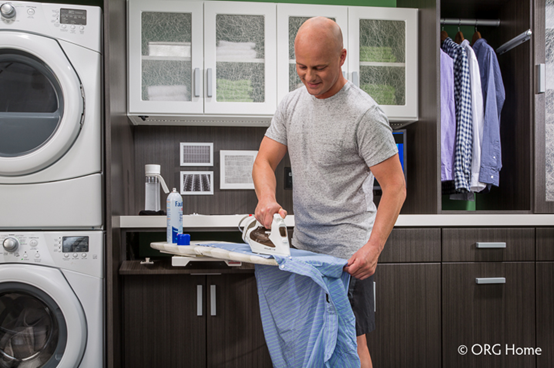 Scrubbing stains or folding clothes on the surface of your dryer can be awkward and cramped. Instead, treat yourself to an open countertop where you have plenty of room to work. Yes, laundry is never-ending, but an organized and efficient laundry room can work wonders when it comes to making this chore more enjoyable!